Assouline & Berlowe has a long history of supporting both the legal and non-legal community in South Florida. From its inception, the Firm has been involved in numerous charitable events and community endeavors. As part of its support for the local legal community and the South Florida Law Schools, the Firm supports St. Thomas University’s School of Law Moot Court Room, where oral argument by the Florida’s Third District Court of Appeals is often held. We as a Firm give thanks to the hard work of the local law schools’ professors and staff, which has allowed the legal community to thrive and produce high quality lawyers and judges. Assouline & Berlowe is pleased to announce that Expertise has selected Assouline & Berlowe’s attorneys as the top 16 law firm for litigation, out of 119 selected. The selection process is performed annually across business categories and geographies. Minor updates may be made throughout the course of the calendar year. Our team conducts a manual review to verify the accuracy of the selections. We then write unique and detailed business descriptions for each hand-picked businesses. Coming off the heels of already winning the Daily Business Review’s Litigation Department of the Year for Real Estate and Other Litigation (for Small Firms of 69 attorneys or less), the firm management is humbled by this award. On September 6, 2018, the Supreme Court of Florida, reconciled a conflict that existed between the appellate district courts of the state, as to when was the trigger date for filing a claim to a surplus from a foreclosure sale. In the case styled as the Bank of New York Mellon v. Glenville, a dispute arose between the former owners of certain real property at foreclosure and a junior lienholder over who was entitled to a portion of surplus funds resulting from a judicial foreclosure sale of the property formerly owned by the former owner. In Glenville, Florida’s high court held that the requirement, which is governed by the Florida Statute, which states that a claim to payment of any surplus funds from a foreclosure sale must be filed with the clerk of the court within sixty days after the sale begins upon the clerk’s issuance of the certificate of disbursements. Two Florida district courts of appeals’ positions were vacated and/or quashed as a result of the Glenville decision, which now clarifies the deadline statewide. Recently, we had a busy week for our client Off Lease Only. Partner David Blattner closed the acquisition of another 2.38 acres in North Lauderdale for the further expansion of their Broward dealership. This is the third parcel Off Lease has acquired for this dealership. The new parcel will allow access to the dealership, located on State Road 7, from Kimberly Boulevard and provide extra parking for Off Lease’s employees. Once again, the seller was Calvary Church of Ft. Lauderdale. The church will lease the new parcel from Off Lease and continue to hold services in the existing church building pursuant to a lease David negotiated. The next day, David finalized a $14,438,000 construction loan with Ally Bank for Off Lease to complete the construction of Off Lease’s new dealership in Orlando. The property, located on Narcoossee Road and McCoy Road near Orlando Airport, was originally 30 acres of raw, undeveloped land. Over the last 4 years, Off Lease has sold a parcel for development to Racetrack Gas and has obtained all the necessary approvals to build this beautiful new dealership. This loan allows Off Lease to construct its dealership on the remaining 23.3 acres. Immigration and Customs Enforcement (ICE) has announced plans to increase I-9 audits this summer and focus on punishing employers who hire illegal workers and deporting of workers in the country illegally. Make no mistake – the punishment to be imposed by ICE can include civil penalties and/or criminal charges. Accordingly, now is the time to make sure your I-9’s are in order and, if they need to be updated because the form of identification on file has expired or will be expiring soon, update them now. Not all employers are enrolled in E-Verify, but many in the know believe the aim of ICE’s aggressive tactics is to increase E-Verify enrollment. While the audits do not include independent contractors, classifying workers as contractors when they should properly be classified as employees may expose employers to headaches beyond ICE: namely the Department of Labor and the Internal Revenue Service. As part of the 2018 tax bill, Congress amended the Fair Labor Standards Act (FLSA) in regards to tip pools and tip ownership. First, under the new rules, employers are prohibited from keeping tips received by their employees, regardless whether the employer takes a tip credit. Second, the new rules state that employers who pay the full minimum wage (currently $8.25/hour in Florida) can allow employees who are not customarily and regularly tipped – like cooks and dishwashers – to participate in tip pools. Note that tip pools must still exclude supervisors, managers and owners. Many employers do not pay tipped employees the minimum wage and instead take a “tip credit,” recognizing that the employee’s tips will bring the hourly rate up to and over the minimum wage. For employers who wish to include back of the house workers in the tip pool, paying the minimum wage rather than the tip credit is a way to accomplish this goal. In the case of Epic Systems Corp. v. Lewis , the U.S. Supreme Court upheld an arbitration clause in an employment agreement which precluded the employee from bringing a class action against the employer. The 5-4 decision authored by Justice Gorsuch makes clear that employer-favored arbitration agreements can be used to eliminate the risk of costly class and collective actions. Opponents of such agreements argued that arbitration could not trump employees’ rights to join together to seek common relief. Based on the holding in Epic Systems, arbitration agreements can be used to eliminate an employee’s right to participate in a class or collective action and require arbitration of the employee’s individual claims only. Those of you who require your employees submit to arbitration to resolve any employment-related dispute should have counsel review the arbitration agreement to ensure that it precludes the employee from participating in a class or collective action. Those of you who do not have arbitration agreements with your employees – either as a stand-alone agreement or as a clause in an employment contract – may want to consider putting this type of agreement in place. As always, if you have any questions about the foregoing or other employment-related matters, please feel free to contact me. Happy Memorial Day to all! Congratulations! On behalf of the Daily Business Review’s Managing Editor Catherine Wilson, Assouline & Berlowe was selected as one of the 2018 Litigation Departments of the Year in the Small Firm Category (under 70 attorneys), Real Estate and Other Litigation category by the Daily Business Review. The DBR announced that the honorees will be recognized at an awards reception on Wednesday, May 30, at the Rusty Pelican, 3201 Rickenbacker Causeway, in Key Biscayne. The event will begin with cocktails at 6 p.m., followed by dinner and presentations at 7 p.m. It goes without saying that the Firm is exceptionally happy to hear of this news. The hard work and results Assouline & Berlowe obtained for its clients in 2017 were taken into consideration by the DBR in awarding Assouline & Berlowe this prestigious award. In January 2017, Assouline & Berlowe, P.A.’s (“A&B”) client, Akbar Nikooie, reached the last stage of a “bet the firm” battle against banking giant JP Morgan Chase (“JPMorgan”) and the once ubiquitous title insurance company Attorneys’ Title Insurance Fund (“ATIF”). In a case that started in 2007, when Mr. Nikooie lost his life savings to a multi-level mortgage fraud on a mansion in the posh celebrity laden area of North Bay Road in Miami Beach, the last issue to litigate in this ten year long epic fight was a four day long trial to determine the amount of attorneys’ fees that should be awarded to Mr. Nikooie and against JPMorgan and ATIF. A&B’s Peter E. Berlowe represented Mr. Nikooie in the original trial on the merits, which was heard in 2010 before Gil Freeman in Miami-Dade Circuit Court’s Complex Commercial Division. Judge Freeman’s judgment in the case was appealed to the Third District Court of Appeal. In 2014, the appellate court, three years after oral argument, split Mr. Nikooie’s mortgage into two parts based upon equitable subrogation grounds. However, after the appeal, Mr. Nikooie’s mortgage was deemed to be in first position on the property. On remand, Judge Thornton, now presiding over the Complex Commercial Division, referred the attorneys’ fees trial to Special Magistrate Retired Chief Judge Joseph P. Farina (the “Fee Trial”). Mr. Nikooie was only represented by A&B partners Eric Assouline and Peter Berlowe. JPMorgan and ATIF, working together, were represented by legal giants Gray Robinson, Carlton Fields, Lerman & Whitebook, and Ballaga & Freeman. Through the Fee Trial, A&B advised that although their case was initially handled on an hourly basis, when the client’s balance grew to a point where he could not keep up with JPMorgan and ATIF’s relentless onslaught, the A&B was prepared to withdraw from the case. A&B ultimately agreed to represent Mr. Nikooie on a partial contingency basis and expended over 3,500 hours on the case. The appeal was handled with co-counsel Erik Scharf on a full contingency basis. Mr. Nikooie sought to have all of the reasonable attorneys’ fees awarded to him and placed on his first position mortgage. Mr. Nikooie also sought a contingency fee multiplier as to any fees that were handled on a contingent basis. At the Fee Trial, JPMorgan and ATIF argued that Mr. Nikooie’s attorneys’ fees should be split into two parts, as was done by the appellate court with the mortgage. JPMorgan and ATIF also argued that Mr. Nikooie should not be granted a contingency fee multiplier. Judge Farina heard testimony from the attorneys in the case and from expert witnesses Glen Waldman and David Friedman regarding the reasonableness of the attorneys’ fees sought. Judge Farina issued a twenty-one (21) page Report and Recommendation and awarded Mr. Nikooie all of his attorneys’ fees and costs, plus a 2.25 contingency fee multiplier, totaling $1,497,913.43, and agreed with Mr. Nikooie that the fee award should all be placed in first position with the first part of Mr. Nikooie’s split mortgage. This trial, which culminated ten years of litigation, was instrumental in bringing the parties to an amicable resolution. Lead partners: Peter E. Berlowe and Eric N. Assouline, of Assouline & Berlowe, P.A. Opposing counsel: Leonard C. Atkins, of Ballaga & Freeman; Carlos D. Lerman, of Lerman & Whitebook; Marty J. Solomon, or Carlton Fields; and, Roland E. Schwartz, of Gray Robinson. Case No. 2: Who Says You Cannot File a Lis Pendens for Unpaid Attorneys’ Fees? A&B represented the personal representative of deceased attorney James Keegan. When Keegan died he had a very large receivable due to his firm for defending a client, Barbara Callado, and her family, on over twenty-five different mortgage foreclosure cases filed across the State of Florida on Callado’s real estate properties. A&B filed suit on behalf of the estate and filed notices of lis pendens (“LPs”) for the particular balances due on the properties Keegan defended from foreclosure actions on behalf of Callado. Ordinarily, LPs are only filed based on a recorded instrument or a fraudulent transaction that involves tracing the funds to the property involved. Callado’s attorney moved to dissolve the LPs and argued that an attorney cannot obtain LPs without having such a right in their retainer agreement, i.e. a charging lien. In response, A&B argued that Keegan had benefited Callado and the property by providing the foreclosure defense services, no different than a material man provides a benefit under the construction lien statute. A&B argued that there was a “fair nexus” between Keegan’s legal fees generated protecting Callado’s properties from foreclosure and the properties themselves. Judge Rodney Smith, the soon to be new federal judicial appointment by the President for the United States District Court for the Southern District of Florida, denied Callado’s motion to dissolve the LPs, and Callado appealed. Miami’s Third District Court of Appeal affirmed Judge Smith’s order denying the motion to dissolve the LPs. With little precedent on this issue, attorneys may now be able to secure payment on their unpaid legal fees through an LP on real property based on their work saving the property from foreclosure, or some other benefit to the property. The hard work establishing this previously unrecognized position was helpful in bringing a resolution to this dispute. Lead partner: Eric N. Assouline, of Assouline & Berlowe, P.A. Case No. 3: Vacation of $2.3 Million Dollar Judgment and Quashing of Service for Non-Compliance with the Hague Convention. Assouline and Berlowe, P.A. obtained the vacation of a $2.3 million dollar default judgment and a charging order on client’s membership interest in a Florida LLC, quashing of substitute service, and ultimately, the Plaintiff’s abandonment of its case against firm client, Andrés Alvarez Fonseca. Local international dispute resolution firm GST LLP (“GST”) represented Plaintiff WF Worldwide Group Mexico Financiamiento y Colocación de Equipo (“WF Worldwide”) and obtained the 2.3 million dollar default judgment that was ultimately vacated. When Mr. Alvarez Fonseca, a Mexican businessman with real estate holdings in Miami, first approached the firm, he had just learned of the case against him and the resulting default judgment. Upon consultation with Mr. Alvarez Fonseca, the firm took swift and aggressive action that resulted in a significant victory for the client. Upon investigating the lawsuit, A&B learned that Plaintiff WF Worldwide had filed the case on September 9, 2016. Plaintiff had then unsuccessfully attempted to serve Mr. Fonseca, a Mexican National residing in Mexico, in Miami and Mexico under the Convention on Service Abroad of Judicial and Extrajudicial Documents in Civil and Commercial Matters (the “Hague Convention” or the “Hague”). Upon its unsuccessful service attempts, Plaintiff sought substitute service through the Florida Secretary of State. Plaintiff submitted an affidavit of substitute service with the Court and subsequently obtained a default judgment in the amount of 2.3 million dollars against Mr. Fonseca. A&B first filed Defendant Andrés Ricardo Alvarez Fonseca’s Motion to Quash Service of Process and Motion to Vacate Default Final Judgment (“Motion to Quash and Vacate Judgment”). Therein, A&B argued that Plaintiff’s substitute service was defective, primarily, because compliance with the Hague is mandatory where there is an occasion to transmit judicial documents for service abroad and Plaintiff had failed to comply with the Hague by prematurely seeking default judgment in contravention thereof. While A&B’s Motion to Quash and Vacate Judgment was pending, Plaintiff moved forward with its collection efforts. During this time, Plaintiff obtained a charging order against Mr. Fonseca’s interest in a LLC, which held real property in Miami. A&B filed a Notice of Appeal on the Charging Order. Honorable Judge Eric Hendon who presided over the case heard the Motion to Quash and Vacate Judgment, agreed with A&B’s argument, and ordered the substitute service quashed and the subsequent default judgment and charging order vacated. After agreeing to accept service on behalf of its client, A&B cemented its victory by filing a strong Motion to Dismiss for Lack of Personal Jurisdiction or Forum Non Conveniens and in the Alternative to Compel Arbitration (“Motion to Dismiss or Compel Arbitration.”). The Motion to Dismiss or Compel Arbitration was the last filing in the case, as Plaintiff abandoned its prosecution of the matter. The case has since been closed. Lead partner: Daniel E. Vielleville and Peter E. Berlowe of Assouline & Berlowe, P.A. Although Assouline & Berlowe has other departments, the litigation department was built through the backbone of the firm’s founders, litigators Eric Assouline and Peter E. Berlowe. 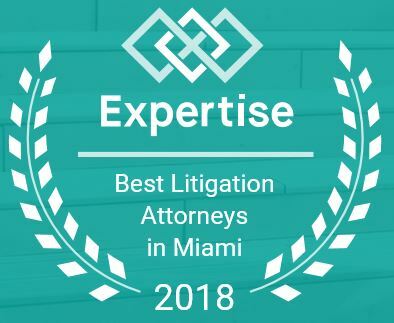 Assouline & Berlowe litigation attorneys have regularly had to go up against some of the top attorneys and firms in South Florida in battles against much better funded adversaries. Never deterred, the firm has pressed on, often against the odds, in order to zealously represent their client’s interest. Eric and Peter have steadfastly trained their associates to work with the same ethic and have only brought in partners with the same mindset. In no year in the past has this been more evident than in 2017, when the firm’s resolve was truly tested. Founded in 2003, Eric and Peter obtained their litigation training as associates working with some the top lawyers in their fields at the international powerhouse, Weil, Gotshal & Manges, LLP. At Weil, Eric and Peter were trained to accept nothing short of excellence in their work product and this training was instrumental in building the firm’s culture. The firm’s culture is, and always has been since it was formed, to obtain the absolute best result for its clients, while thinking outside of the box and being ready to keep fighting for the client even when it may not be economically beneficial to the firm. 1. Filed 10 patent infringement lawsuits in the Southern District of Florida ranging from technology for breakaway safety vests to secured automated notification systems. The cases that were filed by the firm are:17-cv-80529 – Electronic Communication Technologies, LLC v. TJX COS, Inc.; 17-cv-80512 – Electronic Communication Technologies, LLC v. Lumber Liquidators, Inc.; 17-cv-80511 – Electronic Communication Technologies, LLC v. Balsam Brands, Inc.; 17-cv-80385 – Electronic Communication Technologies, LLC v. Gemvara, Inc.; 17-cv-80259 – Electronic Communication Technologies, LLC v. Batteries Online, Inc. Opposing counsel includes: Bob Lee, Esq. of Alston & Bird LLP; Neil McNabnay Esq. of Fish & Richardson; David Finkelson, Esq. of McGuire Woods, Eleanor Barnet, Esq of Heller Waldman. 2. Resolved various patent infringement and declaratory judgment cases filed in Ed. TX, N.D. Iowa, and N.D. Indiana; Peter A. Koziol of Assouline & Berlowe was the lead partner on the Triple7Vaping.Com, LLC case, as he replaced Jerold Schneider (of Schneider Rothman IP Law Group) who at the time was 2017’s Florida Bar Intellectual Property Law Certification Committee chair. Opposing counsel was:Ms. Ranieri’s co-counsel were: David Conrad, Esq. and Ricardo Bonilla Esq. of Fish and Richardson (Dallas, Texas); Mathew S. Sarelson Esq. of Kaplan Young & Moll Parron (Miami) The main contact person for the Intellectual Property litigation department is Peter A. Koziol, Esq., pak@assoulineberlowe.com – Telephone: 561-361-6566. 3. Served as lead counsel in a highly publicized action filed by the Electronic Frontier Foundation against the nation’s allegedly most “prolific’ patent licensing entity (according to the EFF), Triple7Vaping.Com, LLC et al v. Shipping & Transit LLC, S.D. Fla. Case No. : 16-cv-80855, and Case No. 17-1066 (Fed. Cir. 2017). 4. Led litigation and/or licensing negotiations in over 200 patent infringement matters (some pre-suit) throughout the United States in 2017 alone (approximately 10% being filed in various district courts throughout the country); According to Justia, this accounts for approximately 15% of the total patent litigation new cases filed in the Southern District of Florida for 2017. 17-cv-80914 – Safety Supply Corporation v. Abel Unlimited, Inc. In 2017, due to its litigation strength, the firm was able to resolve many matters for clients without filing suit. The firm helped it clients manage large portfolios of IP assets, including patent portfolios under development and used these assets to foster joint ventures, licensing and cross licensing agreements. The firm’s clients were able to use funding generated by licensing for further research and development of new technologies. However, when the clients’ intellectual property was misappropriated and the parties were unable to resolve their disputes amicably, the firm represented its clients in Court over what were often highly contested positions. Peter A. Koziol chairs the Firm’s IP litigation department, which also includes Peter E. Berlowe, Eric N. Assouline, and Greg M. Popowitz. The firm credits the IP litigation department’s success with its client’s favorable positions, its members, and the additional support that it receives from the firm’s staff and other attorneys who are either seasoned litigators with experience in business, trade secrets and anti-trust law, or Florida Board Certified in Intellectual Property Law like partners Ellen M. Leibovitch and Loren D. Pearson. It is Assouline & Berlowe’s experience that although IP litigation is generally a specialty practice, various litigation strategies require input from experts in other practice areas to obtain the best results possible for the client. Unique to Assouline & Berlowe is the law firm’s dedication to its current and past clients and the sophistication and experience of its attorneys which all share a strong focus and team approach to promoting business, commerce and technological innovation. This included, for example the firm being retained in 2017 to defend an inventor funded company, Shipping and Transit, LLC (“S&T”) in a highly publicized dispute filed by the Electronic Frontier Foundation (“EFF”). The EFF, which openly advocates for the abolition of software patents and is funded by variously similarly minded organizations (see, e.g. https://www.eff.org/thanks), sought to invalidate U.S. Pat. Nos. 6,415,207, 6,763,299, 6,904,359, and 7,400,970, and accused S&T of violating Maryland Law. The Order of Dismissal is attached and also available at: https://ecf.flsd.uscourts.gov/doc1/051117870855?caseid=485292&de_seq_num=337. For questions about Assouline & Berlowe PA and any of its 2017 achievements, please contact Eric Assouline, Esq., co-founder and Litigation Department Chair.